Note: The product I recommend when it comes to activated carbon is Nature’s Way Activated Charcoal. If you have any questions regarding that product, please ask it in the comment section bellow. Thanks and enjoy the post! Bloating and intestinal gas can be both a painful and embarrassing problem but activated carbon is a simple and effective remedy. Here’s how you can use it to greatly reduce stomach gas problems and remove toxins from your digestive tract. Activated carbon is a special kind of charcoal, usually made from coconut shells or bamboo, that has been oxidized at extremely high temperatures to change its structure into a highly porous state. 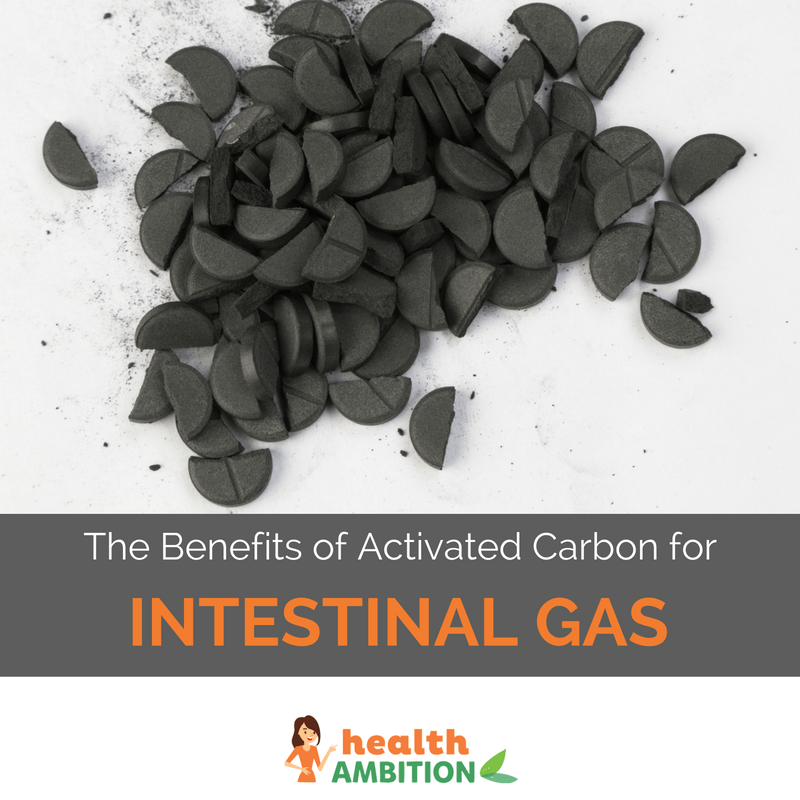 Millions of tiny pores in the activated carbon electrostatically sponge up gases and toxins in your intestines and lock them away for elimination. Most toxic substances in your gastrointestinal tract, like the chemicals in processed foods, carry a positive charge. One of the main benefits of activated carbon is that it has a strong negative charge that literally draws these chemicals, traces of heavy metals and other undesirable contaminants into its structure. It has even been shown to absorb and trap hydrogen sulphide, also known as ‘rotten egg gas’ for good reason. Importantly, activated carbon is not metabolized in your body in any way. It passes through your digestive tract like a million microscopic vacuum cleaners, hoovering up toxins as it goes. However, since it’s so good at it’s job, it’s necessary to take it only at certain times and in a certain way. You should always take activated carbon on an empty stomach with a large glass of water, well away from meals, supplements and particularly medications. It’s recommended to only take charcoal at least an hour before and at least two hours after eating. It’s also strongly advisable to have it well away from important medications as it may interfere with their absorption. I’d suggest discussing using activated carbon with you physician before taking it if you are currently on prescription medicine or are being treated for gastrointestinal disease. First thing in the morning can be a good time to take charcoal capsules for general cleansing if you can wait for at least an hour before having breakfast. It would be even more beneficial to have it with that other great digestive cleanser – fresh lemon juice in water. Other possible times would include mid morning, at least an hour before lunch or any other food, mid afternoon or right before bed, as long as you’ve eaten at least 2 hours before. Staying within these guidelines, it may be particularly beneficial to take activated carbon before a seafood meal, due to the risk of heavy metals like mercury and cadmium, or food containing non-organic meats that are often contaminated with antibiotics and hormones. The recommended dosage for reducing intestinal gas and bloating is between 500mg and 1000mg taken with a large glass of water. Ideally have another glass of water soon afterwards to really make sure it gets out of the stomach and into the intestines where it can get to work. Activated carbon capsules are the easiest way to take it and this dosage would usually equate to 2 – 4 capsules (though check the bottle). Tablets are also available but take longer to disperse which isn’t ideal. Activated carbon powder is probably the most cost effective way to take it, but is a little more effort to make up. Whatever you choose, make sure the label says food grade activated carbon powder, sometime called USP grade. This is of course a completely different type of product to the charcoal bricks you get for the BBQ. Those would be quite toxic so please no one confuse the two and try and use that as a cheap replacement. Be aware that taking the larger doses of activated carbon may turn stools grey or even black. This is normal so don’t be alarmed. It will also give you an idea of how long things take to go through your system the first time you use it. Any longer than a day and it might be worth considering an oxygen based colon cleanse. Occasionally, some people have reported activated carbon making their constipation worse. This should be largely avoided by following the directions and timing advice earlier and drinking lots of water when taking it. As a precaution, it’s best not to use it until you have cleared up any constipation issues. Activated carbon is also currently not recommended for pregnant women and those with kidney, liver or gastrointestinal disease. Once again, always check with your doctor before taking it if you are on medication. It’s probably best used occasionally rather than too regularly, but can be very useful to have on hand whenever your digestive system is telling you you’ve overdone it a bit with an earlier meal. Here’s a video showing how activated charcoal can naturally enhance your beauty! High quality activated carbon capsules taken with a big glass of water provides a simple and effective way to greatly reduce or eliminate bloating and excessive intestinal gas. I’d be interested to hear your results if you try it for yourself.